Introducing Milk-Bone® GnawBones®, rawhide alternative dog treats in two distinct shapes. Made with real chicken, this long-lasting treat encourages chewing, which helps clean teeth, and it's easy on the digestive system. Chews for dogs come in too many forms to count — and they’re not all created equal. Milk-Bone® GnawBones® dog chew bones and twists are non-rawhide treats as safe and healthy as they are delicious. They come in two shapes and two sizes, so you can pick the best dog chews for your favorite fur ball. And every variety is packed full of perks for your pet, from teeth to tummy. Rawhide alternative ensures a safer, splinter-free chewing sesh. Wrapped with real meat and totally tummy-friendly. For that naturally chomp-worthy chicken flavor dogs love. Slow-dissolving chews can give teeth a nice long polish that your pooch will actually enjoy. Choose knotted bones or twisted sticks, or get both and mix things up! 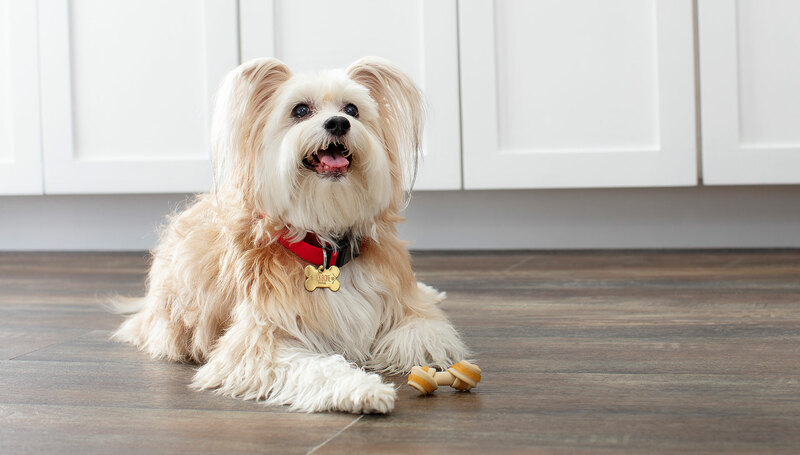 *Find Milk-Bone® GnawBones® with rawhide alternatives. Reward your dog with this new chewing challenge.